Gazpacho is a Spanish soup dish served traditionally during the summer season. The soup is made with fresh peppers, tomatoes, and cool cucumbers. 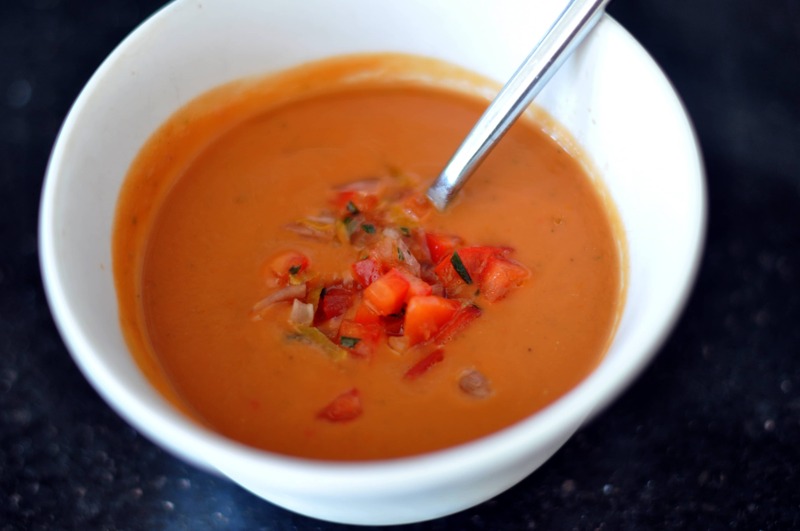 Aside from being delicious, the cannabis-infused gazpacho is very easy to make. You will also need ¾ cup of cannabis-infused extra virgin olive oil, which you can prepare using the recipe below. First, decarboxylate your cannabis. For this step, spread the product into a baking sheet lined with parchment paper. Bake at 120°C for around 25 minutes. When done, transfer it to the Mason jar and mix with the olive oil. You may also add lecithin powder in order to prevent the oil from separating. Next, cool your oil in order to speed up the process of infusion. This is done by filling a pan with water halfway and leaving it to simmer. Now, place the Mason jar that contains the oil with cannabis to the water bath and then cook for about 1-hour while stirring constantly. Finally, strain the olive oil first in a mesh sieve and into the cheesecloth. Now that you have the Cannabis-infused olive oil, it’s time to start preparing the Cannabis Gazpacho. Next, chop the stale bread to cubes of around 1 cm. The bread can give the soup more depth. Place the bread and the veggies you prepared earlier to a blender. Add water, vinegar, and seasoning. Then, pour the cannabis oil to the mixture but make sure you save some of it for garnishing later. Start blending the ingredients until they produce a soup with smooth and thick consistency. Taste the gazpacho and season if needed. Transfer to a jar or bowl and leave to cool in the fridge for around 30 minutes. Consider garnishing your gazpacho to make it even more flavorful. There are many ways to garnish the soup. You can perhaps sprinkle it with croutons or some veggies, such as cucumbers, peppers, and tomatoes that are finely chopped. After you sprinkle your garnishes, drizzle the soup with the remaining cannabis-infused olive oil.